Carnsew culvert three turbine installation concept. Credit Mojo Maritime. Could Hayle become a world leader in small scale tidal energy generation? On Tuesday 20th September 2016 we h0sted an exhibition to present ideas about how the town could become a world leader in small scale tidal energy generation. Today tidal energy is one of the last known untapped renewable energy resource capable of delivering significant levels of clean, green energy generation. Tidal range energy was first harnessed as early as 60AD in Britain, when it was used to drive tide mills for a range of agricultural and other milling purposes. While there has been some renewed interest in developing large scale tidal range schemes across the world, including the recently approved 320MW Swansea Bay lagoon scheme, the opportunity to assess whether the tidal range resource can potentially be exploited at a smaller more accessible scale, utilising existing infrastructure, heritage and natural resources is yet to be explored. To focus the spotlight on the potential of small scale tidal energy generation, some preliminary feasibility work has been carried out to explore the options for small scale tidal generation at Hayle’s Carnsew and Copperhouse Pools. 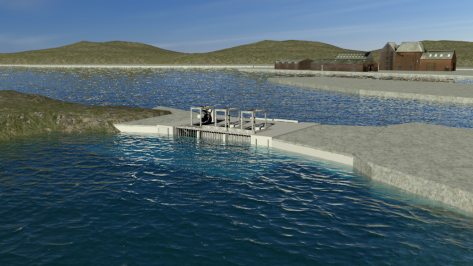 The project is exploring the potential to create an integrated solution to sluicing, flood protection and clean energy generation using small underwater turbines. The feasibility project has been led by Community Energy Plus which has commissioned the Falmouth-based marine renewable energy consultant Mojo Maritime, part of James Fisher and Sons plc, to carry out the preliminary technical feasibility studies. The work has been made possible thanks to funding from the Rural Community Energy Fund (RCEF) which is a £15 million programme, delivered by the waste and resources charity WRAP and jointly funded by the Department for Environment, Food and Rural Affairs (Defra) and the Department for Business, Energy & Industrial Strategy (DBEIS). It supports rural communities in England to develop renewable energy projects which provide economic and social benefits to the community. If you would like to provide your feedback on the proposals, please use the form below or click on this link. Feedback is requested by 27th September 2016.